I am back in Chicago. The Ponies have met Memphis, and an epic meeting it was. My flight was delayed getting out of Chicago on Thursday, and involved several gate changes, so those of us on the Chicago-Memphis flight actually cheered when they started letting people on the plane. We flew to Memphis without incident. Once there, my instructions were to proceed until I encountered either the baggage claim or someone related to me, whichever came first. It was a pleasant surprise that there was a delegation waiting at the gate for me. What with the new post-9/11 airport rules, you can't do that anymore unless everyone is flying into the airport, which we all were. I was the last Pony to arrive, so once we collected my bags, we headed off for the hotel. After a short rest, we embarked on a Pony Planning Session. This originally started as the "where do we go for dinner?" discussion, but, as these things do, it threatened to morph into a strategy meeting for the entire vacation. However, on account of the timing of my flight, I hadn't had lunch, and I was getting hungry and cranky. One well-timed whine put an end to the extended campaign strategy meeting, and we started thinking about where the good barbecue joints were. Fortunately, the Tribune had done an extended article on Memphis barbecue the day before, and I had brought that section with me. We perused it, and decided on a place called Corky's. This turned out to be a good choice. Even on a Thursday night, Corky's was packed, a good sign in a restaurant. The food was everything the Trib promised it would be. We ordered various animal parts cooked slowly over hickory chips and smothered in barbecue sauce (I had brisket -- who knew you could barbecue it? ), and some of us split an order of hush puppies, for no better reason than that we'd never had them before. They turned out to be pretty good, not much of a surprise, since it's hard to mess up deep-fried cornmeal dough. After we got back from Corky's, we had Dad Pony's formal birthday party-ette in Aunt and Uncle Pony's room. As party favors, everyone had a little bag of M&Ms printed with "Dad Pony's 60th" and an Elvis t-shirt. For the piece de resistance, Aunt Pony had made an Elvis quilt! Friday involved three activities. In the morning, all of us made the trek to Sun Studios. This unprepossessing building with a dingy storefront in a dumpy part of town was the home of Sam Phillip's Memphis Recording Service ("We Record Anyone. . . Anything. . . Anywhere"). It was at that very building that, on July 18, 1953, a young truck driver named Elvis Presley showed up asking to record a song to give to his mother for her birthday. He paid four dollars for the privilege, and the dingy storefront entered history. You can take a tour of Sun Studios today that has a few artifacts from both the early days of blues recording and Elvis's school days, then continues downstairs to the preserved front office where Elvis first walked in the door (complete with a 1953 vintage Pepsi vending machine -- a real antique! ), and then the recording studio itself. Sun Studios still makes records in the evenings, and it's the only recording studio to have been designated a national landmark. We took the trolley back -- Memphis's public transportation consists of city buses and cute little vintage electric trolleys that run on rails -- and then the party split up. Mom Pony, Dad Pony, and I took Little Sister Pony to tour St. Jude's Children's Research Hospital. This tour is far more interesting and less ghoulish than one might anticipate. For those outside the U.S. who haven't seen the infomercials, St. Jude's is THE premier research and teaching hospital specializing in catastrophic pediatric diseases, mostly cancer, but also other blood and bone diseases and pediatric AIDS. They take you through some of the treatment rooms and tell you lots about the services and research that St. Jude's offers. Among other things, it pays for all the treatment, food, transport and lodging costs for patients and their parents, so that kids can get the treatment they need without money being an extra burden. They have world-class research facilities and share all their discoveries immediately with the rest of the world. A high-class institution indeed. And among the crowds of Memphians who donated towards its establishment was -- yes! -- Elvis Presley! On Friday evening we took in a minor-league ball game at Autozone Park. The Memphis Redbirds are the Triple-A farm team for the St. Louis Cardinals (boo, hiss! ), and they were playing some team from Texas. None of us had any investment in either team, so we were free to sit back and enjoy a pretty good game. It was a perfect evening for a ballgame, too -- warm and clear, but not boiling hot. Saturday was Elvis Day! We got up early and headed out to Graceland. Dad Pony was prepared, already wearing his Elvis shirt. We got tickets that let us into a variety of attractions. While we waited for the shuttle to take us from the museum complex to the mansion, we could tour the Elvis Airplanes, the tiny, garishly decorated Hound Dog II and the much more lavishly appointed Lisa Marie, which is kind of like Air Force One only fancier. Graceland itself is not as big as you'd think, especially when you think of what pop stars today buy. It's a big, fancy house, but not outrageously big. The upper floor is private, but you get to see the public areas of the house like the parlor, the dining room, the kitchen, the jungle room, eksetra. These are decorated in a sumptuous yet charmingly kitschy style -- someone described it to us as "wealthy 70s Southern tacky." No matter how big a superstar he was, Elvis maintained pretty working-class tastes throughout his life, and this gives Graceland a charm that makes even the green shag carpeting on the floor and ceiling of the jungle room and the circular fake fur bed with the radio in the hood seem cute. Elvis himself is buried out in the Meditation garden, along with his parents and his grandmother, as well as a cenotaph for his twin brother, Jesse, who died at birth, but who might have been the original Elvis impersonator had he lived (raise your hands if you didn't know Elvis Presley was a twin). After lunch at one of the Elvis cafés, we toured the Automobile Museum, where you can see Elvis's cars, including the famous pink Cadillac, saw an Elvis documentary in the Bijou theater, visited the Elvis gift shops, where I bought the tackiest cheap souvenir I could find for one of my co-workers, and had Elvis ice cream. Finally, we decided that we were done Elvising, and piled into a taxi to head back to the hotel. You don't just go to Graceland -- you Elvis, and the Pony clan definitely Elvised. Dinner was at a steak house run by a gentleman that Aunt Pony had met while we were out at St. Jude's, and it turned out to be pretty good. That evening, some of us went to see the city of Memphis fireworks display over the Mississippi. I have to say, in all other respects, Memphis is a fine, if somewhat shabby, city. But with the fireworks, the city is made of fail. Specifically, they neglected to tell anyone exactly when the fireworks would happen. Apparently, last year's fireworks started at 9 p.m., an eminently reasonable hour. So the parks filled up with Memphians around quarter of nine. We proceeded to wait, being eaten alive by mosquitoes, for a full hour. Yes, those fireworks did not start till ten at night, by which point only three of the Pony Party remained to see them. But they were just spectacular. Sunday morning, we split the party again. Some of us went to Mud Island, where there are apparently things to see. Dad Pony and Little Sister Pony and I went to the Memphis Rock and Soul Museum, where you can look at artifacts tracing the development of rock 'n' roll, soul, and the blues from down-home country music, all with a little mp3 player where you can play either little wodges of information about the displays, or you can do what we did, which is just play music all the way through. You can, for instance, listen to Bill Monroe's original version of "Blue Moon of Kentucky," and the Elvis's cover of it (which is how I learned that neither Dad Pony nor Little Sister Pony have any bluegrass in their souls -- they both hated Bill Monroe's rendition), and you can hear Big Mama Thornton's original "Hound Dog." For lunch, we went to B.B. King's Blues Club. I was pleasantly surprised to see that they were open for lunch on Sunday. I had wanted to go there -- how can you go to Memphis and not go to a blues club at least once? -- but the elder Ponies are aging rapidly, and there wouldn't have been a chance to go in the evening. Lunch was a nice alternative, and we heard a dynamite blues band, featuring a singer who was a dead ringer for Tina Turner. Mom Pony bought a CD as a present for Uncle Denethor. The food was mediocre, but it was edible, and you don't go to B.B. King's Blues Club for fine dining anyway. After lunch, some of us headed to the National Civil Rights Museum. This is built around the Loraine Motel, where Martin Luther King, Jr. was assassinated. 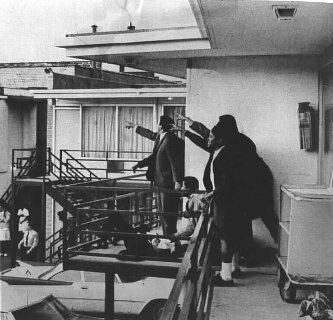 The side of the motel has been preserved, and it's instantly recognizable from the famous picture taken after Dr. King was shot. The museum itself is a timeline that starts before the Civil War and leads right up to Dr. King's visit to Memphis during the sanitation workers' strike, at which point you find yourself in the portion of the building that is the actual Loraine Motel, looking at Room 306, where Dr. King stayed. Very well designed. The museum continues in the next building, across the street. This one isn't so well done, but its highlight is that it's the boarding house where James Earl Ray fired the shot from, and you can stand in a window pretty close to the bathroom window where he stood. This is a museum that's well worth seeing, should you find yourself in Memphis. We had dinner, then collapsed into bed. We spent Monday morning just schmoozing, then we piled into a cab to go to the airport. The cabbie was well practiced at taking tourists from the hotel to the airport, because he had a CD of Elvis tunes on the theme of farewell that he interspersed with clever patter, perfectly timed to keep us entertained right up until he pulled up at the drop-off. We tipped him handsomely, then went to check in for our various flights. Mine was canceled. Apparently, a failed car-bomb plot in Scotland means that airports in the U.S. are duty-bound to go into a decapitated-chicken frenzy and shift planes around right and left, and my flight was canceled, because they needed the aircraft somewhere else. Fortunately, I was able to book onto the very last seat on a different flight heading to Chicago an hour later. So, just a minor scare. We had lunch at a nice café in the airport, then said our Pony farewells and headed for our various gates. My flight, once I was booked onto it, was utterly uneventful. When I arrived in Chicago, canyon_lady picked me up at O'Hare and whisked me off to Evanston. In Evanston, she, lcohen, rhobike and I taped a little program about shape-note singing for a project that one of lcohen's friends was doing for a video class, to be aired at some point in the future on Evanston public access television. That was lots of fun. I have to say, we sound really good as a women's quartet -- kind of like the Anonymous Four, only more shape-note-y. And I continue to maintain that we are the best goshdarned women's shape-note quartet ever to perform on Evanston public access television. as far as i'm concerned, we are the best darned women's shapenote quartet to perform in evanston, period. at least on the streets in july. reading this reminds me of so much from when i went in 1999 ;-) . The Peculiar Four are ready to hit the big time. Now all we need is an indie film director trying to set an ancient Greek myth in a quirky yet adorable period of American history, and we're all set. Did you go Elvising, too? i did not go elvising but i did go to mud island, i think, and i know i went to the national civil rights museum. the funnest thing that i remember is that they have a scaled version of the mississippi on whatever island i was on that was very cool. That would be Mud Island. Mom Pony and Uncle Pony told us all about it, in great detail. Sounds like you had obscene amounts of fun. I doubt we'll ever find ourselves in Memphis but the NCRM will be a must-see if we do. Apparently, a failed car-bomb plot in Scotland means that airports in the U.S. are duty-bound to go into a decapitated-chicken frenzy and shift planes around right and left, and my flight was canceled, because they needed the aircraft somewhere else. We did have lots of fun. The Pony Family can turn any event into a party. We didn't even see half of what we could have seen in Memphis. The zoo and the W. C. Handy museum are next on our lists of things to do if we go back. I saw on the news how the actual British persons actually affected by the actual burning SUV kind of shrugged and said they'd be somewhat more observant during their vacations, but no one did anything drastic like prevent the princes (whose necks seem to be disappearing a little more each year) from throwing their big Diana party. I'm still not sure how this translates in America to "ZOMG terrorists in England! Cancel random flights from Memphis, Tennessee to Chicago, Illinois!" It's gotten so easy to terrorize Americans that even some half-potted British al-Qaeda wannabe can do it without even actually blowing up an airport. "ZOMG terrorists in England! Cancel random flights from Memphis, Tennessee to Chicago, Illinois!" Hey, at least they had an excuse. A few months ago I ended up driving 800 miles back to Chicago because they cancelled my flight for no reason at all. It's a good thing you have a driver's license! There's no way for a government to win, unfortunately. If they cancel flights and take extra precautions (I'm assuming that was the stated reason for the canceled flights - to better deal with security for the people who would be flying), people will complain. But if everything goes as normal and then something happens in the US, we'll hear, "Why didn't they do anything?" During September 11th, flights in and around Europe were also canceled. Now I know 9/11 was a much larger event, but officials in Britain didn't know that at the time. And you know what? I've seen it documented on TV shows over here how British travelers bemoaned the interruption when it was "Just happening in America." But the truth is, you never know, and driving a flaming SUV into a terminal of Scotland's largest airport is a much more credible threat than America usually needs to turn up security. I know I shouldn't give the benefit of the doubt to this administration anymore but I shall. Britain and America are very much connected politically Re: al Qaeda, and attacks against one nation have historically had a knock-on effect in the other country (9/11, 7/7, and any other numbered names for terrorist plots out there). So I dunno. It was quite a big deal over here but, since nothing ever materialised in America, I guess you're right that the US's precautions were without warrant. no one did anything drastic like prevent the princes (whose necks seem to be disappearing a little more each year) from throwing their big Diana party. You weren't allowed to drive anywhere near Wembley that day, so I consider that a precaution Re: car bombs and flaming SUVs. Also, I would be shocked if security weren't on higher alert, since the terror threat level in Britain is currently "Red" (arbitrary as those threat levels may be...). Aside from scale, there are two major differences between 9/11 and Flaming SUV Day. The first is that 9/11 was a plot that pretty much succeeded, whereas Flaming SUV Day was a plot that pretty much failed. The other is that 9/11 took place in America, while Flaming SUV Day took place in Great Britain, a country which is between six and nine hours ahead of U.S. time, depending on where in the country you are. By the time peak flying hours in the U.S. rolled around, everything that was going to go down on Flaming SUV Day had already gone down. Yet they were still canceling flights two and three days after the (non-)event. I might concede the "peak flying hours" point. But I don't think the success or failure of the Glasgow plot would have had anything to do with whether the rest of a planned terrorist attack was successful, i.e. I doubt al-Qaeda terrorists in America, getting ready to do something similar in an American airport that day, would have switched off CNN in disgust and said, "Oh, nevermind now!" when the Glasgow plot was not 100% successful. Thing is, given al-Qaeda's track record, I don't think they're capable of pulling off a plot like that in two countries at once, especially two countries separated by the Atlantic Ocean. Their biggest job ever was 9/11. That was staged for maximum effectiveness, and it was all over in about three hours. Nothing al-Qaeda has done since, foiled or successful, has been that elaborate. And, if you're terrorists looking for maximum exposure on a two-country strike, hitting Scotland while it's still night in the U.S. is not good planning. If they'd seriously had the will or the imagination to do anything in the U.S. on Flaming SUV Day, they would have planned it better. My goodness, FP. It sounds like you had a terrific time. I didn't realize there was that much to do in Memphis. I'd forgotten all about the Civil Rights Museum being there. Is that the place with monument designed by the same person who designed the Vietnam Memorial? It has water flowing over a stone engraved with that quote about justice flowing like water and peace like an everlasting stream? I hate flying these days. The airlines seem to feel duty bound to screw you. I had no idea of all there was to do in Memphis, either. I knew about Graceland, a couple record studios, and that there were blues clubs. But it turns out that we didn't even see half of what there was to see. Who knew that Memphis could be such a happening place? I didn't see a monument fountain at the Civil Rights Museum, but maybe they'd turned the water off. Memphis seems to be undergoing a drought right now. All I have to say about the airport incident was that at least it wasn't another Cleveland. I looked the memorial up and it's in Montgomery, Alabama. It is indeed by the same woman who designed the Vietnam Memorial. Maya Lin does good monument design. I think my favorite story about her is that she was an architecture student when she designed the Vietnam Memorial. That design was selected in a blind national contest, but her design professor at Yale didn't like it and gave her a B for the course. Years later, she is a World-Famous Architect who flies all around the world giving lectures and being celebrated for the Vietnam Memorial, which is held up as a classic in art departments everywhere. One day, she called up her old Yale design professor and asked if, given all of this frenzy, he would consider retroactively raising her grade in that class. He refused. God love Yale professors. Your family sure knows how to have a good time! It's weird. When I'm with the Pony clan, I feel no shame whatsoever about doing the cheesiest, most touristy things, and having a blast doing them. You just kind of enter the Rolling Party Zone, where everything is allowed. Welcome back, FP! It sounds like you had a ball. Boy did you pack a lot into the few days! It never feels like we're expending lots of energy when we're out there doing stuff, but then I come back home and write it up for you guys, and I realize just how much we did do. It was quite something. Oh, we had scads of fun. I try to give a sense of that when I write up a Pony Holiday (tm). Everyone should share in the fun! I've been to Memphis twice and didn't have nearly enough time there on either occasion, so I certainly enjoyed visiting vicariously with you. Aieee! Though I suppose bluegrass does take some getting used to if you haven't had much exposure to it. I bet you covered a few activities that we didn't. The committee of the whole met on Monday morning and determined that we really should go back and do Memphis again. I love Dad Pony and Little Sister Pony, but, alas, alackaday, they're not perfect.